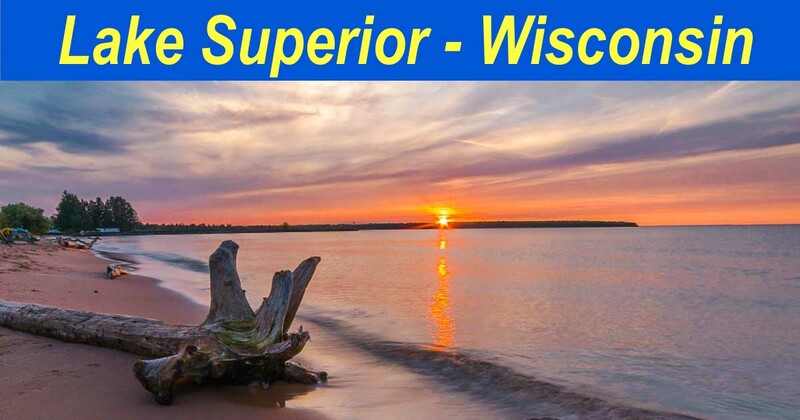 Wisconsin’s Lake Superior Shoreline – Cute Towns & Great Sunsets! 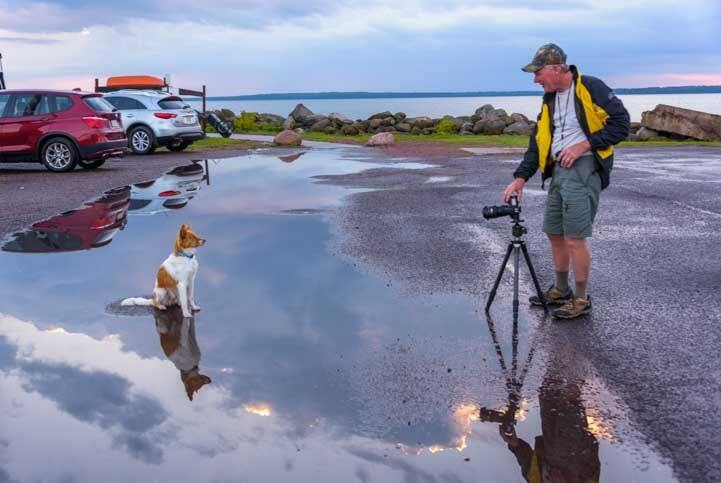 September 2018 – After our delightful stop in Walker, Minnesota, we continued our RV travels towards Lake Superior, and we made landfall (waterfall?) 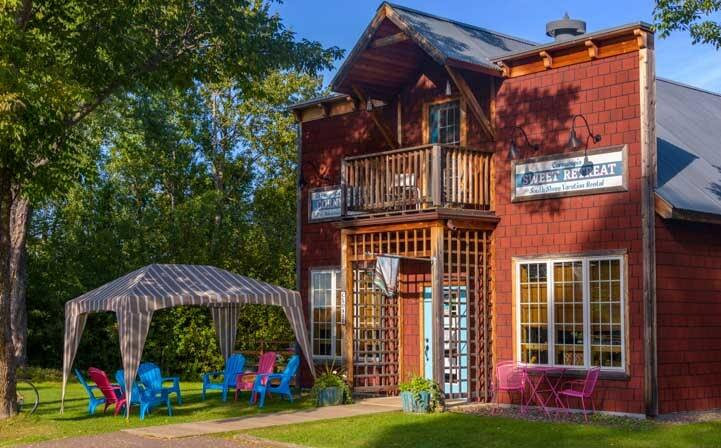 just east of Duluth on the lakeshores of Wisconsin. Our first glimpse of mighty Lake Superior was very humble. We parked the rig and ran down a short path between thigh high bushes to a spot where endless small waves landed on a thin ribbon of driftwood strewn beach. The water was very red and muddy. We thought the red tint would look cool at sunset, but we were too excited to stick around to wait for sunset, so we kept going. 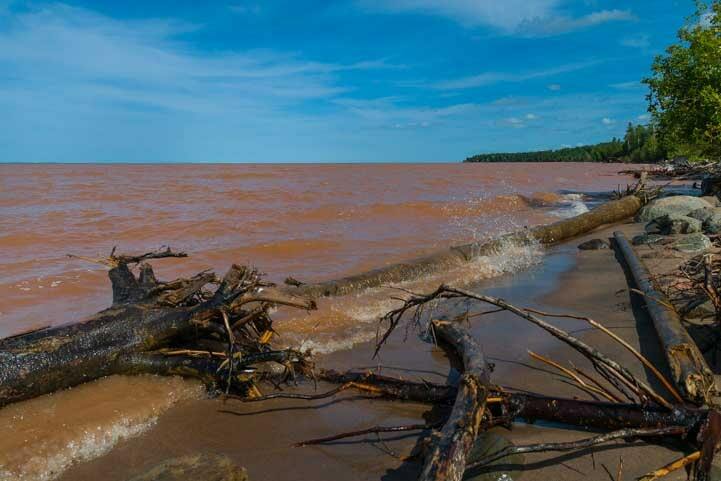 Our first glimpse of Lake Superior — It’s red! The road hugged the shoreline but offered few views of the water until we rounded a slight bend and saw the most charming harbor. Big sailboats were lined up by docks along the shore. When we spotted sailboats in a small harbor we had to stop. 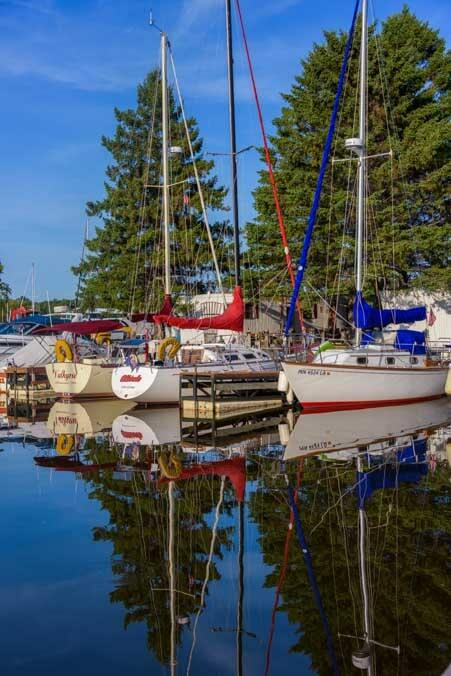 The juxtaposition of the tall pine trees of Wisconsin and the towering masts of ocean worthy sailing vessels was fantastic. 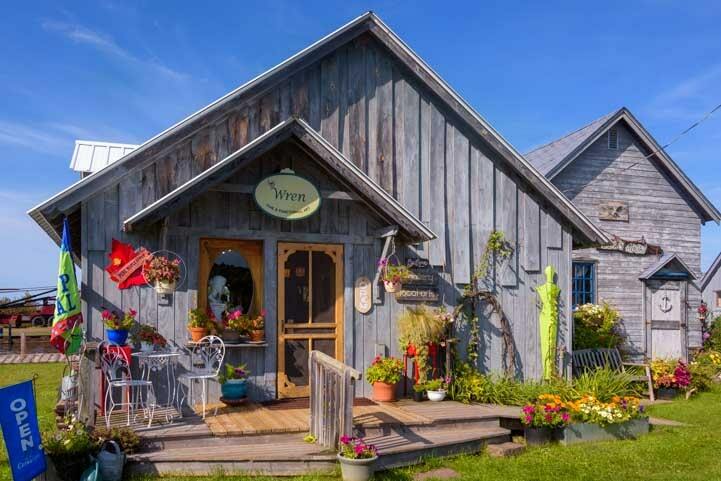 We were in Cornucopia, a little beachside hamlet that has a few charming tourist boutique gift shops. Pretty tourist boutiques were lined up by the docks. So cute! Summer flowers on the sides of the buildings. Across the street there was a small cluster of buildings that make up the town. Cornucopia is nicknamed “Corny,” and the Corny Coffee Shop was very inviting. Across the street we found the Corny Coffee Shop. But the area that kept drawing us back was the little harbor. 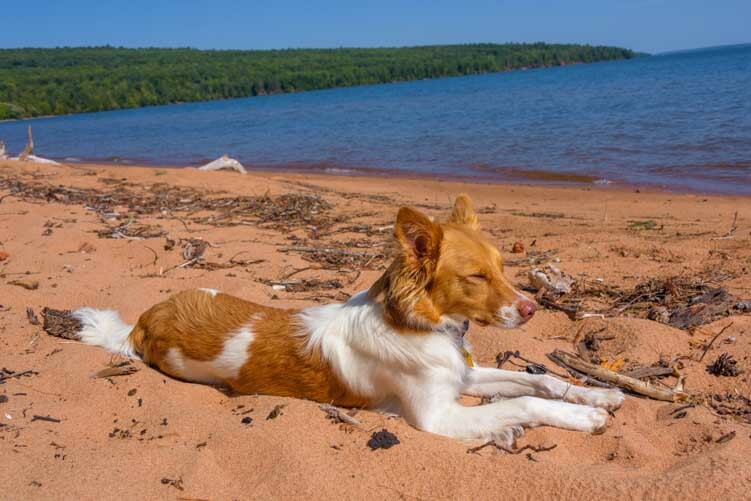 Just a little further east on Wisconsin’s Lake Superior shoreline we found Meyers Beach. The National Park Service has a tiny outpost here for the Mainland Sea Caves around the corner, and lots of people launch their kayaks from the beach to get to them. 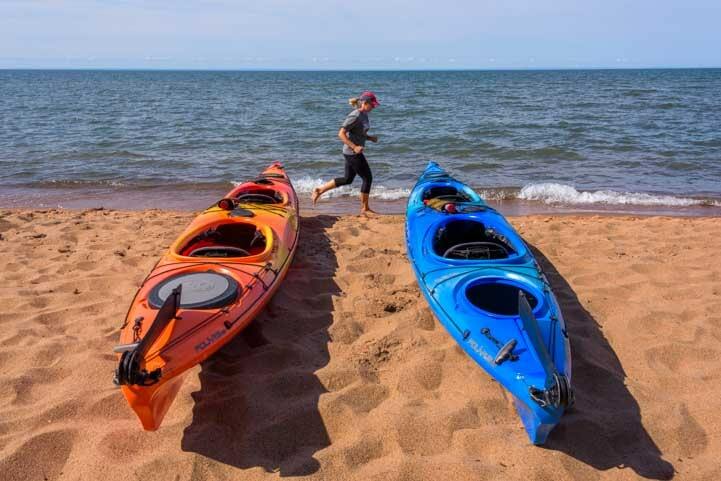 A kayak returns to Meyers Beach from the nearby Sea Caves. Every so often in the latter part of wintertime this part of Lake Superior freezes and you can walk the mile or so out to the sea caves. This happened a few years ago, and when the phenomenon made the national news, the cars lined up for miles as people came to Meyers Beach to explore the frozen caves. Kayaks head out towards the Sea Caves. From Meyers Beach we traveled to Little Sand Bay on the northern tip of this peninsula on Wisconsin’s Lake Superior shoreline. There is a campground up there with lots of boating activities in the summertime. It was pretty quiet by this time in September, but we did catch a cute pic of our fifth wheel next to a sailboat on a trailer in the parking lot! Up in Little Sand Bay we got a kick out of seeing our buggy next to a sailboat on a trailer. 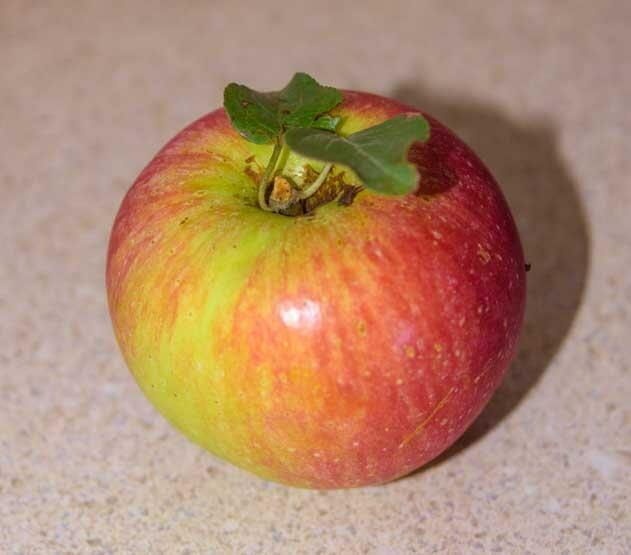 Fall was progressing and apples were ripening on trees all over the place. One day when we parked I noticed that the ground was strewn with apples. I looked up and the tree branches above me were filled with ripe apples. I picked a few, and those were the juiciest and most sweet/tart apples we’ve had in a long time. The apples were tastiest when eaten with thin slices of extra sharp Wisconsin cheddar cheese to go with. When we first got to Wisconsin I started hunting around for a good sharp cheddar and discovered that unlike cheddar cheese from other places (like Vermont), all Wisconsin cheddar cheeses are yellow, no matter how mild or sharp! Juicy, sweet and tart, and especially delicious with Wisconsin extra sharp cheddar cheese! 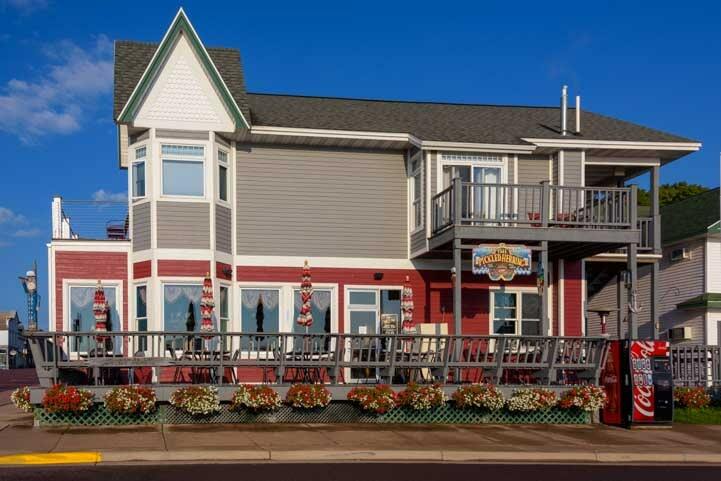 Our shore-side route along Wisconsin’s piece of Lake Superior took us to Red Cliff where we found a wonderful restaurant, campground and marina right on the edge of the lake at the casino. A little further down the coast we found the pretty town town of Bayfield. 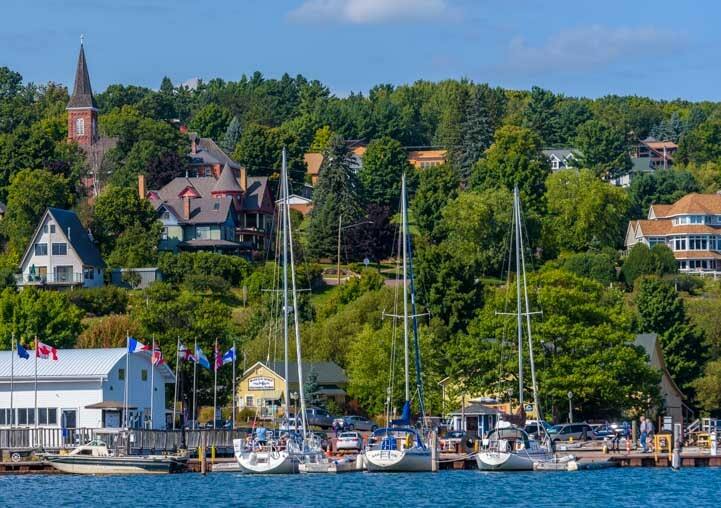 Bayfield, Wisconsin, is a picturesque waterfront town on Lake Superior. We made our way down to the boat docks. 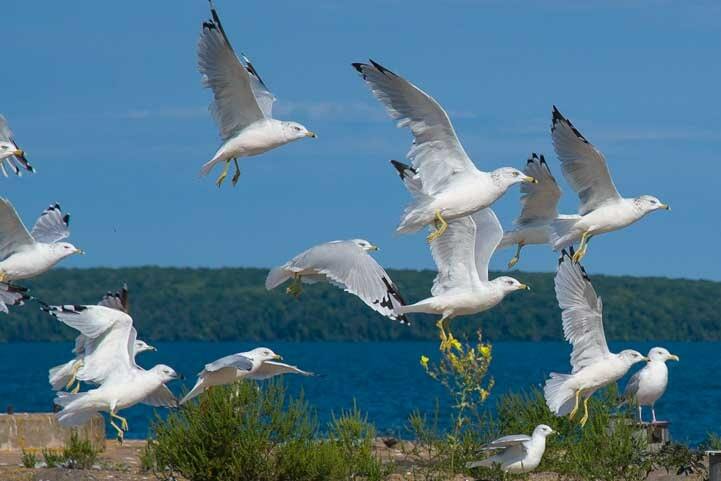 A big flock of resident seagulls took off as we approached. 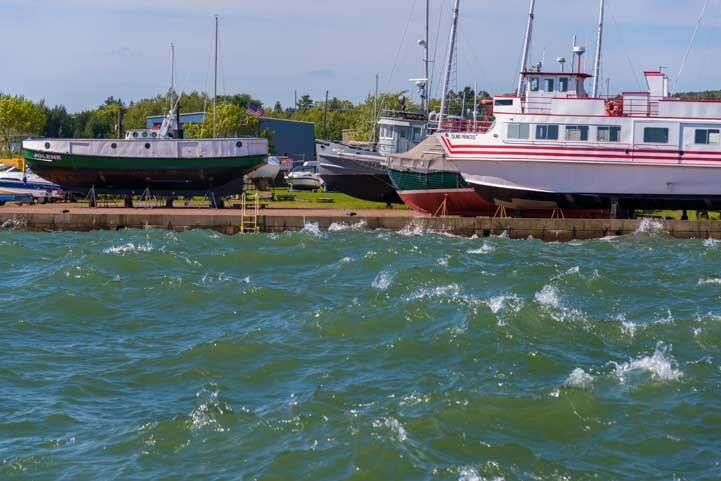 As we talked to boat owners about what it’s like to sail on Lake Superior, I noticed that many boaters had planted flowers, tomatoes and peppers in between the rocks in the breakwater that protected their boats from the wild waves of the lake. What a clever idea! Almost every slip resident had created a boatside garden in the rocks. 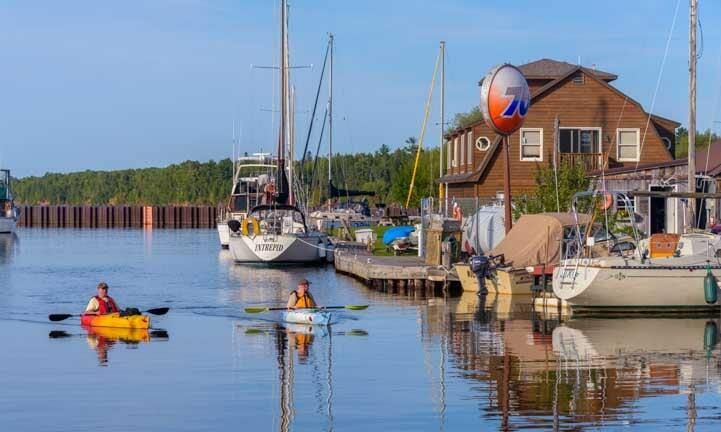 At Bayfield Marina boaters planted gardens between the rocks in the breakwater. So clever! 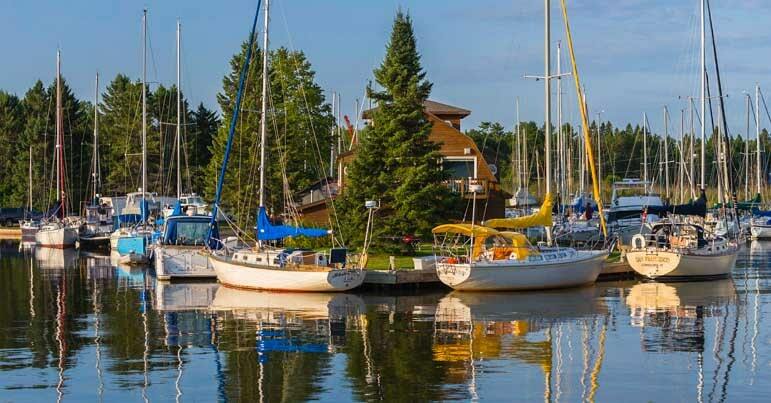 Bayfield is a charming waterfront town that has a very salty air, even though it is on a lake and not the ocean. Old Salts and a pirate’s parrot on freshwater Lake Superior. One morning we got down to the waterfront at dawn to take some photos. The sun was playing games with the clouds, and as we walked around Memorial Park taking pics, I captured a photo of the sun peeking out from behind the clouds and backlighting a flag on a lamp post. Later that day when I was going through my photos I realized the date was 9/11. The photo seemed very fitting. 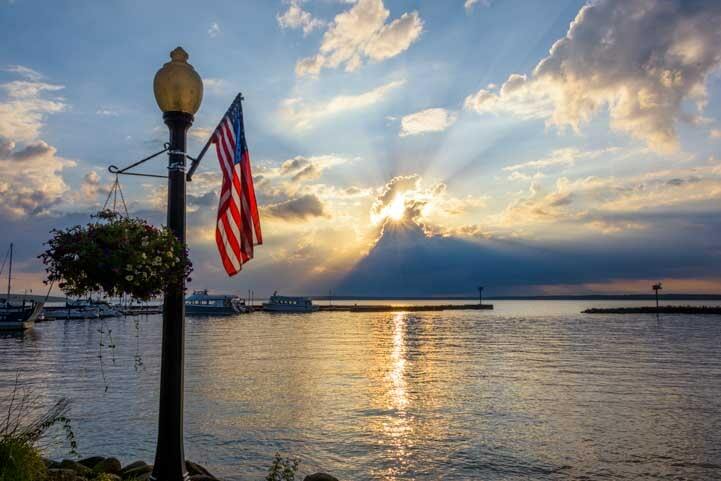 Dawn in Bayfield, Wisconsin, on 9/11. Up in town there were several coffee shops, and once the sun was up we picked a place for a morning cuppa joe. 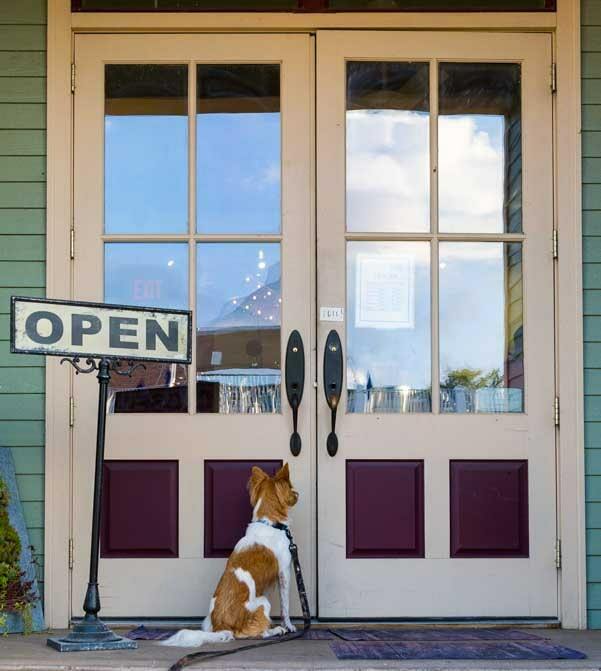 Buddy saw me go into the coffee shop and sat transfixed by the slightly open door until I emerged again, latte in hand. Buddy waited expectantly outside while I got coffee and muffins. A lot of rain had fallen overnight and there were big puddles in the parking areas near the marina. As we walked back down through the parking lot Buddy wandered through a puddle and then suddenly sat down in a dry spot. He was on his own little island. 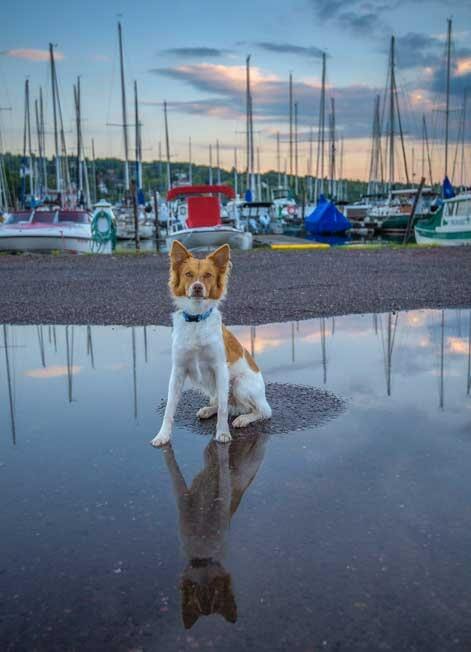 In a mellow mood, Buddy suddenly began to model for us on a dry spot in the middle of a puddle. 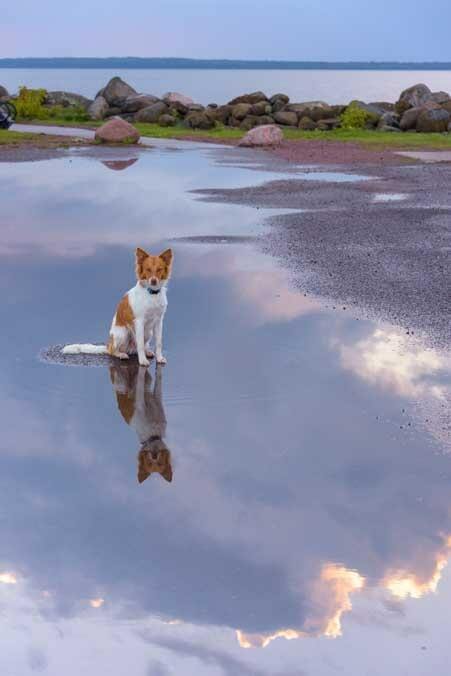 We both noticed that the puddle was creating fantastic reflections of him as he sat there, and for some reason he seemed very content to stay on his little island for quite a while. I crept around him to try to line him up with Lake Superior in the background. We couldn’t believe he stayed so still for so long. Looking at the pics afterwards, I turned my laptop on its side to show the above photo to Mark. As I flipped the laptop back, I caught a glimpse of the image upside down. Wow!! It was as if Buddy was sitting in the heavens! 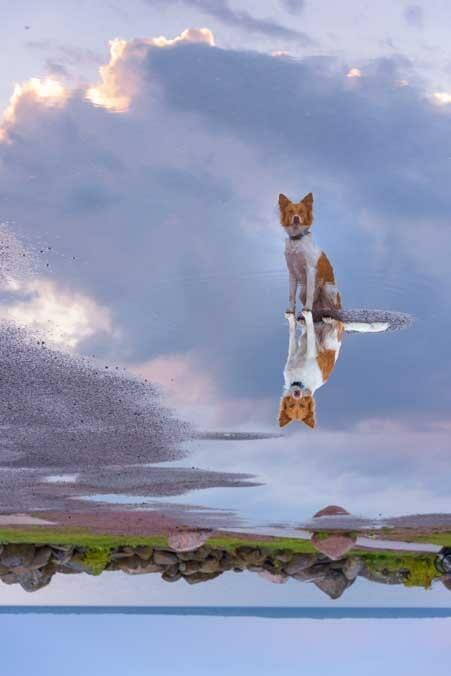 Our friend Bob who has created many marvelous magazine covers of Buddy for “Dog Life Magazine” (pretend ones, of course) had suggested a while ago that Buddy’s song is “Buddy Angel,” sung to the tune of the 1960s hit “Johnny Angel” (listen here). Although Buddy is definitely a little angel sent to us straight from heaven, he is still very much a dog. A little further south when we did a brief walk through the woods to get down to the beach, Buddy suddenly stopped at the foot of a tree and stared into the branches. 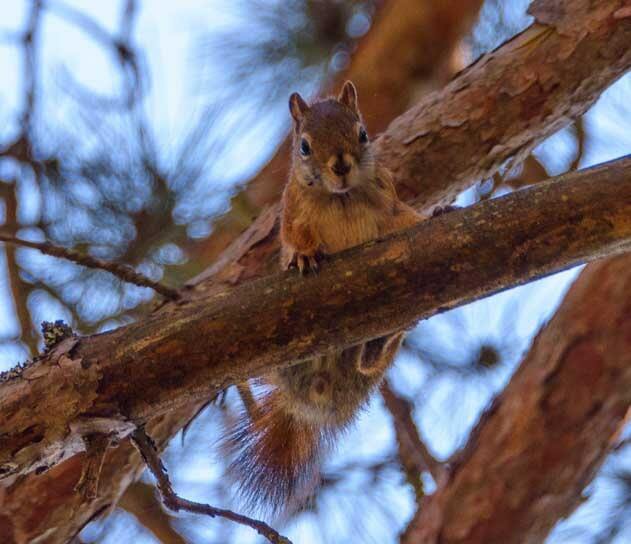 High overhead a little squirrel scolded him. 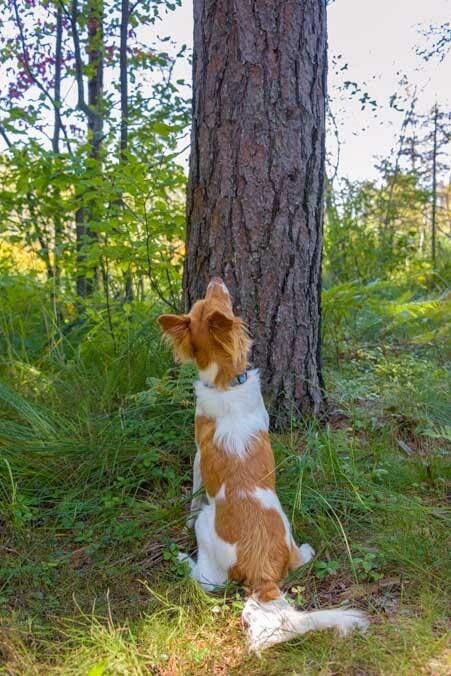 With his angel wings folded Buddy is still all puppy as he looks up at a squirrel in the tree. But it was lying in the warm sand that was most satisfying. We had arrived on Lake Superior just in time for a fantastic week of Indian Summer and the temps were in the 80s. I was astonished that the water was fairly warm too and we saw quite a few people swimming. But the warm temps didn’t stop the wind from blowing and whipping up the waves. When we stopped in the town of Washburn the waves kicked up against the town jetty and sloshed all over the place. Wild chop at the jetty in Washburn. This didn’t seem like a great time to jump in the water, but over at a small beach we watched two guys set up their kiteboards for a bit of fun. Kite boarders were thrilled that the wind was up. In just a few minutes they were airborne! 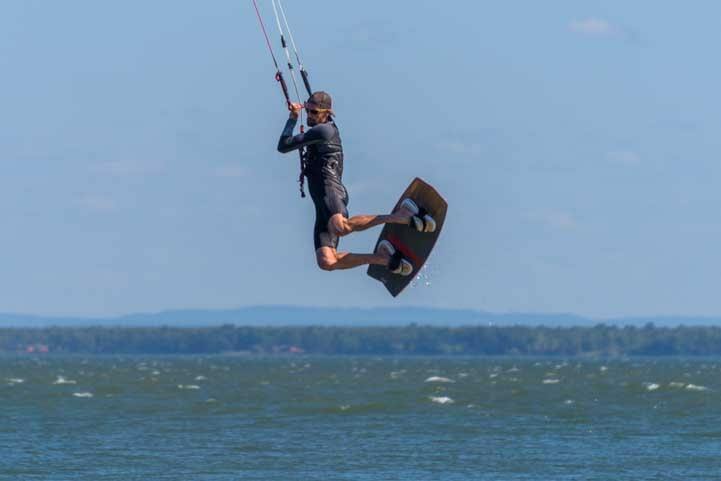 In no time the kite boarders were soaring over the water. 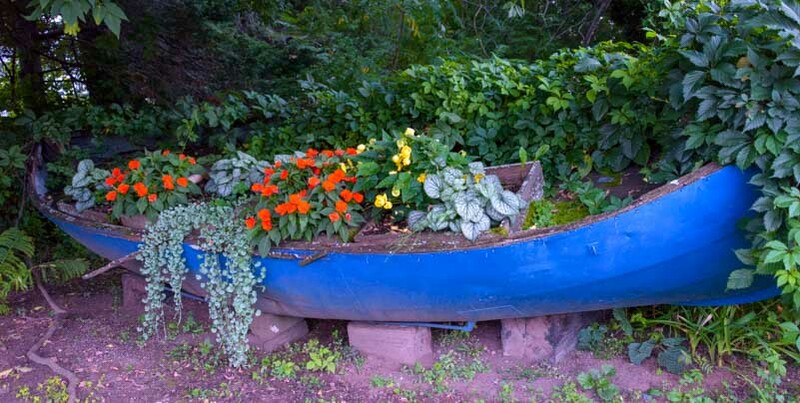 This little trip along the shores of Lake Superior in Wisconsin had been full of delights, including a bright blue canoe that had been transformed into a planter full of flowers. And what a blessing it was to arrive on the shores of Lake Superior in the middle of such ideal summer weather. 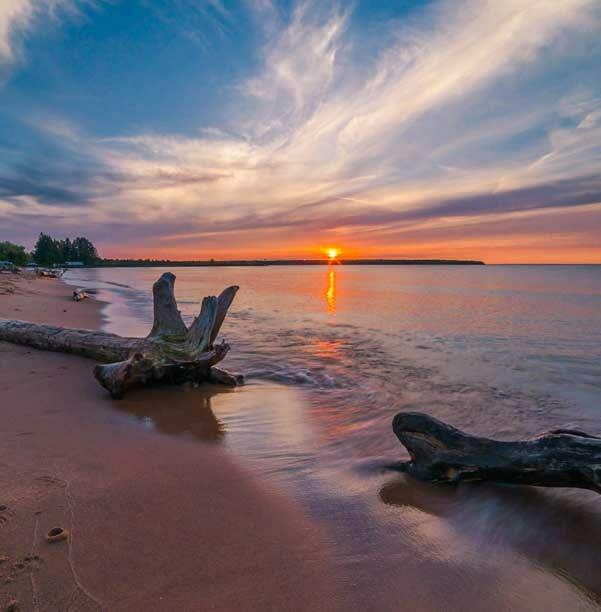 Sunset on Lake Superior in Wisconsin. 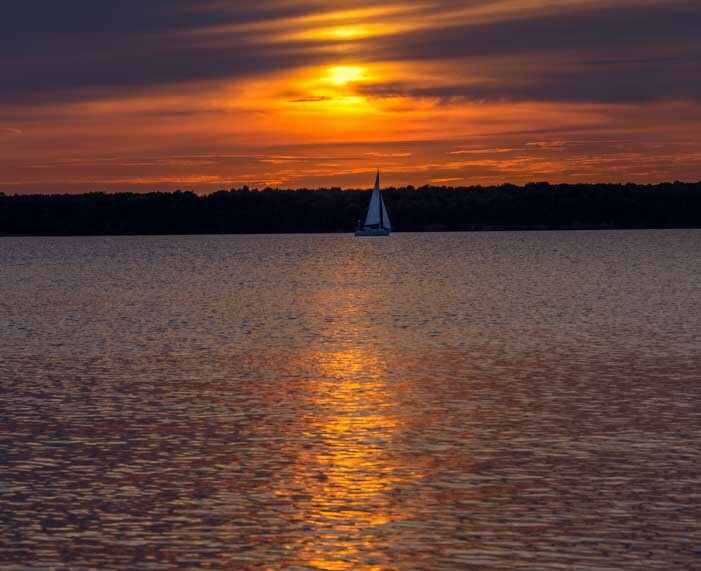 If your travels take you to Wisconsin, be sure to sample some of the shoreline route, even if you have a big RV like ours. This entry was posted in Wisconsin and tagged Back Roads RV Trips, New, Travel, USA, Wisconsin, WP Travel by Roads Less Traveled. Bookmark the permalink. Looks like a good time! Are you heading to the MI UP next? We are here, Steve, and the waterfalls are amazing!! Thanks, Bob. It was a beautiful drive, and so much fun to have such a little sweetie pie with us! Gosh, what a fabulous night that must have been Deborah, and what a great time to be so far north. Thank you for appreciating our pics and for the visual of lightning over the lake. Wow! That sunset picture is outstanding. I love the Buddy pictures. Just looking at him my blood pressure drops. :). He is so calm. 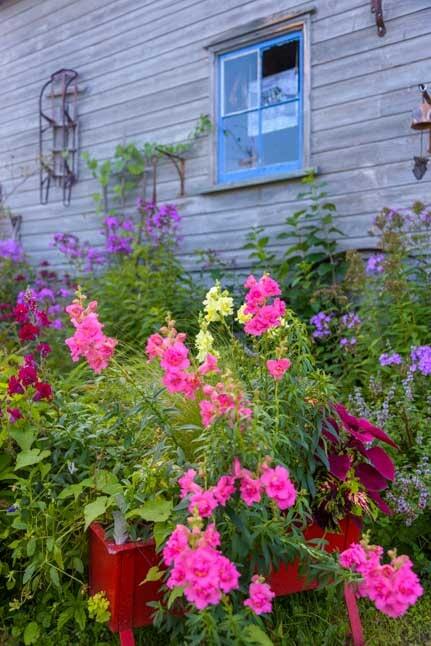 I liked the weather worn buildings with the colorful accents & flowers. What a wonderful discovery you made. “Corny” was such a special spot, Ann. We didn’t expect to see anything like that, and it was very special. I didn’t mention it in the post, but Buddy met a wonderful puppy companion there too, a little fellow about his size and age. They tore around the marina together at top speed and were just adorable when they both got thirsty and found a place to squeeze their two heads together through an opening in the docks to get a drink from the lake. All we could see was two little dog butts and two wagging tales!! We got lots of pics,as always :-). So cute! When you guys discover small towns like Walker … where do you end up staying??? 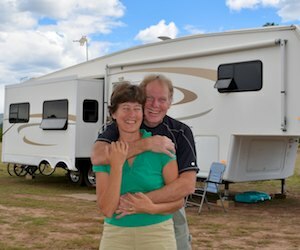 I provide a link to the RV Park Reviews of the area campgrounds on all our travel posts. There are usually plenty of options depending on what you are looking for and how big your rig is. Oh ! Those GORGEOUS skies !!! As long-time “salts”, no wonder you loved the docks lined with sailboats ! And there’s Buddy – in the sky (with diamonds !)…. 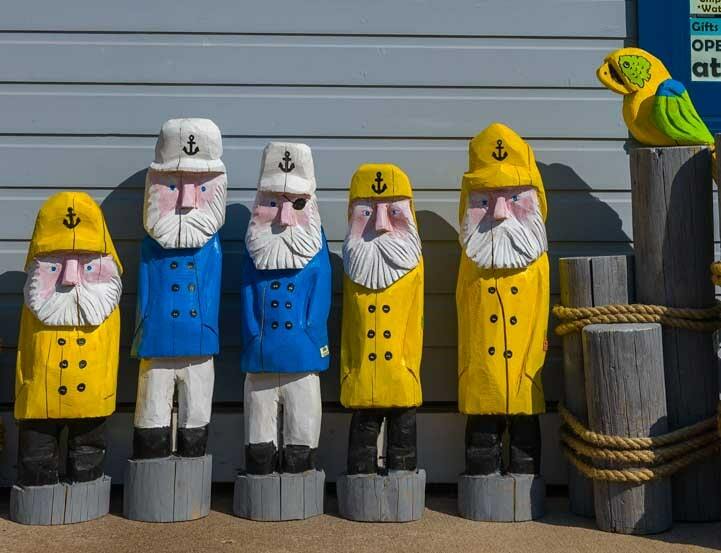 We love wandering the docks (me especially) wherever we go. 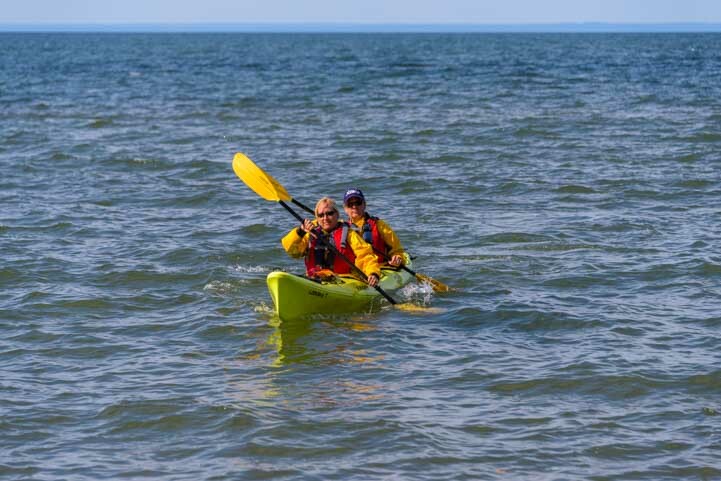 There’s always a sense of familiarity even when the sailors’ adventures are from very different waters like Lake Superior. Some sailors here talked of taking their boats out the St. Lawrence Seaway and down to Florida, a trip that is so different than the one we took in Mexico. And Buddy is definitely our little angel in the sky with lots of diamonds!! Wow, again! I especially appreciate the 9/11 flag picture. I am still misty-eyed when I see Old Glory in all its glory. We have so much to be proud of! We sure do, Jeff, and visiting the many smaller nooks and crannies of America brings it home to us all the time. We are very fortunate to live in such a beautiful country. America is incredibly diverse in every respect, yet it still maintains a unique character that is strong, recognizable and tangible in every corner. you two are amazing thank for all your adventures. and the GREAT PICTURES to boot. Thank you, Cheryl. We are loving life and are very fortunate and blessed to be able to live this way and learn photography as we go! Spectacular photos, Emily! You and Mark have such a great eye for gorgeous pics! Love the sailboat shots, but “Buddy Angel” is my favorite – and priceless (as is Buddy, himself)! Alan and I both appreciated the close ups of the kiteboarders. We had just been camping on the shores of Lake Champlain and had seen them for the first time but we weren’t close enough to figure out exactly what kind of gear they used. (They’re called kite surfers there.) So, thanks for the educational photos! 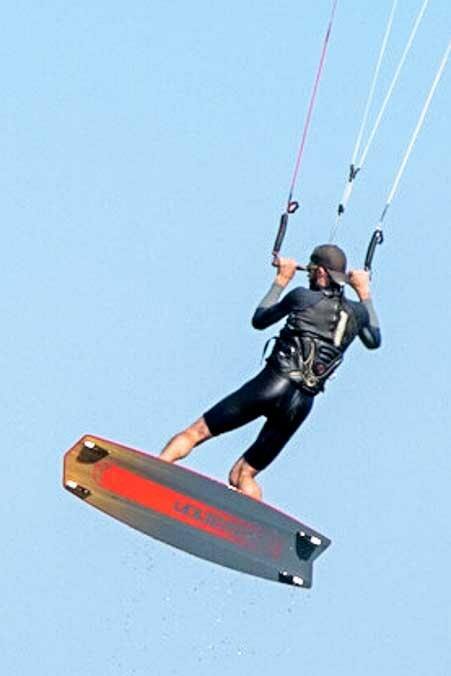 We first saw kite boarding in Puerto Vallarta Mexico when the 2013 World Cup took place just steps from where our boat was moored (our pics and story about it are at this link). It looks like a total blast, and it looks like quite a workout too. 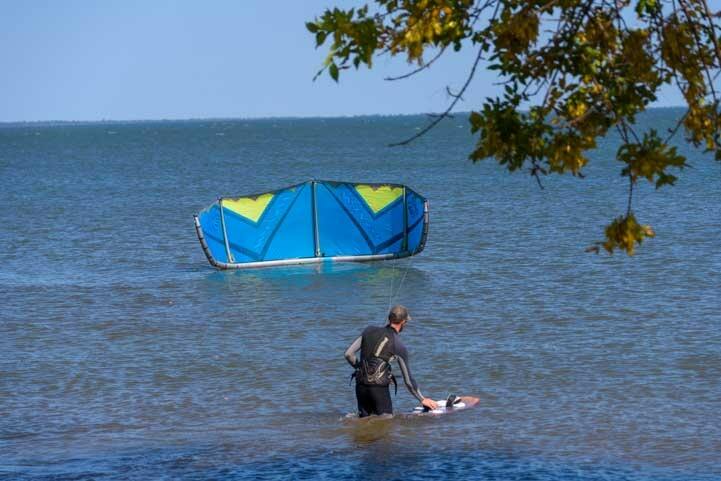 How fun that you saw these “kite surfers” too! Oh, and Buddy sends a tail wag to ya, Mary. Thanks for reading! !